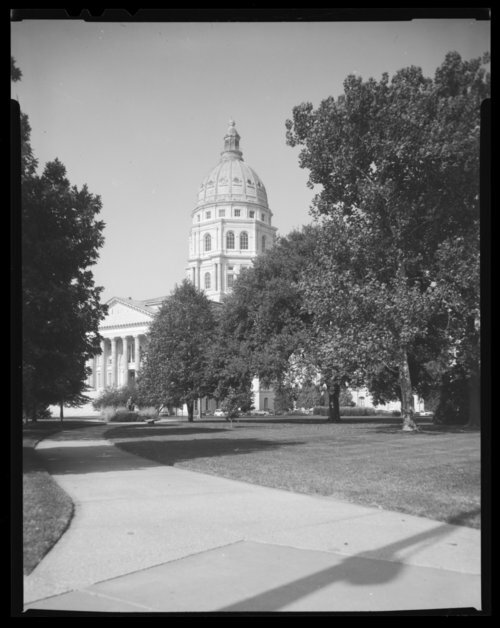 This black and white photograph shows a southeast view of the Capitol in Topeka, Kansas. Located on twenty acres of land, once owned by Cyrus K. Holliday, work began on the capitol October 17, 1866, when the cornerstone was laid for the east wing. Thirty-seven years later the statehouse, an example of French Renaissance architecture and Corinthian details, was competed at a total cost of $3,200,588.92. The Kansas Legislature meets in the building and the office of the Governor is in the structure as well. For many years, the Kansas Supreme Court was housed in the Capitol, also.